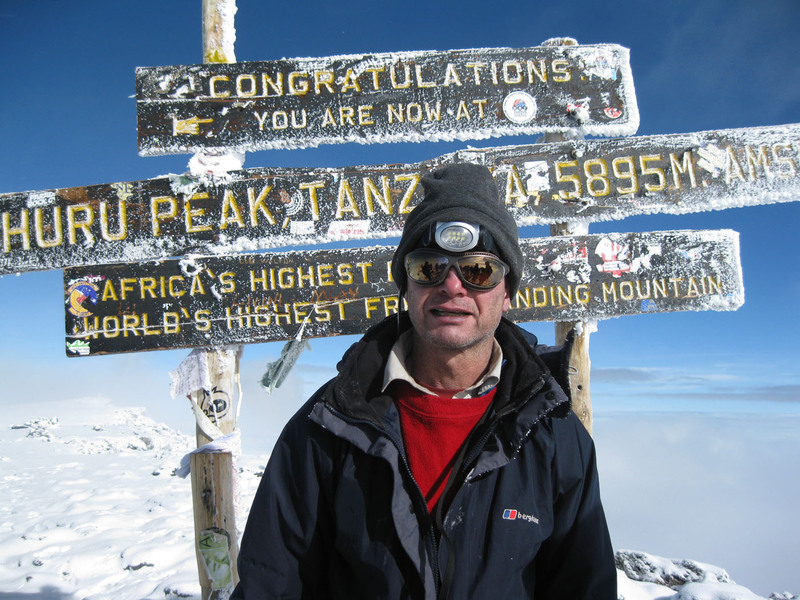 I am pleased to report a successful climb of Kilimanjaro from 9-18 October, reaching the summit at 8am on 15th October. I had begun to think that I wasn't meant to do this trek. Originally planned for June/July, it was can celled as the travel company had put my name incorrectly on the flight bookings. Then, having booked to go in October (with Adventure Peaks of Ambleside) I sent my passport off to get a visa ... and it didn't come back! So that meant a trip to Liv erpool to replace the passport, then a two day visit to London for the visa. Thankfully that was the end of the problems. I met up with five others at Manchester Airport for an early flight to Kilimanjaro via Paris and Nairobi, getting to the Keys Hotel at Moshi just after midnight. I met the rest of the party (11 plus the leader) at breakfast, then we set out by minibus for the start at Rongai Gate. This took more than four hours over very rough and dusty tracks, and when we reached the gate we were all extremely dirty before even having started walking! 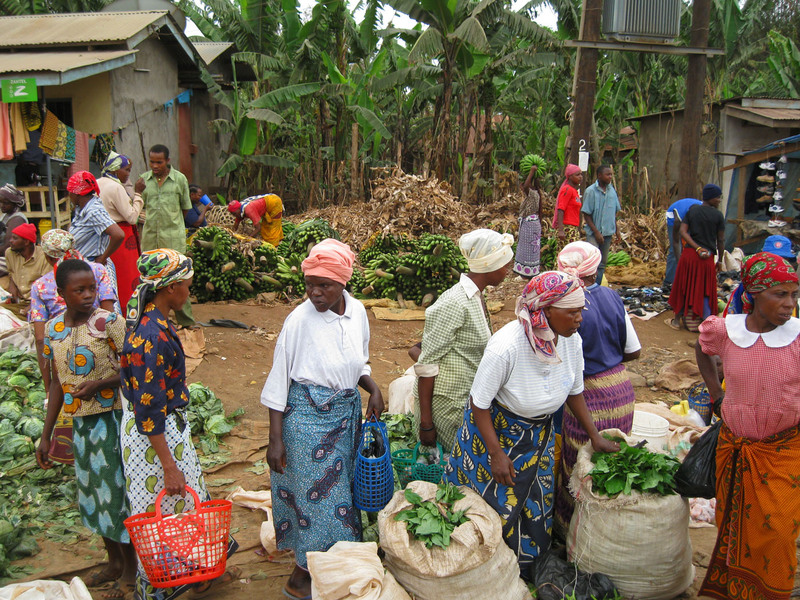 On the journey we saw a lot of the locals going about their daily business in the banana plantations and the village markets. School children returned home dressed immaculately in their uniforms. The first day's walk was a leisurely 3 hours, passing some Colobus monkeys, before reaching camp just as it was getting dark. The porters had already set up the tents and prepared dinner (soup, main course and fruit, with tea/coffee). And there was no sitting cross legged on the floor, we were provided with tables and chairs which the porters carried up on their heads. No wonder that we needed 48 guides/porters to support the 12 of us! 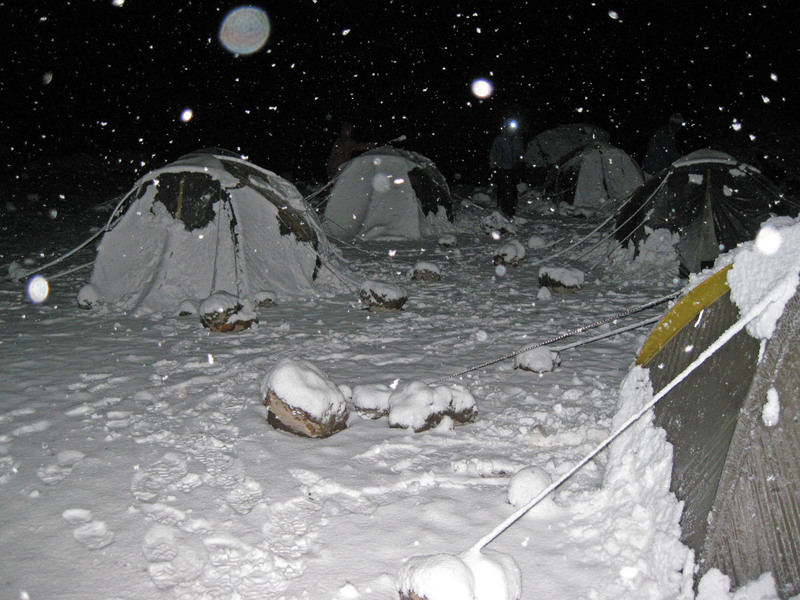 The second day was a steeper climb for 5-6 hours up to the second camp at Kikelewa (3,600m). The weather continued to be hot and sunny, with views north right across the Kenya plain to the mountains beyond. Day three saw us heading towards Kilimanjaro's lesser peak, Mawenzi, where we camped at Mawenzi Tarn (4,330m). The fourth day was an acclimatisation day at Mawenzi. We climbed and scrambled up the ridge on Mawenzi gaining around 500m before returning to the camp and chilling out for the afternoon. Day 5 was the trek up to Kibo Huts. Although only 7½ km it took around 5½ hours as walking was now very slow due to the reduction in oxygen. The landscape here was almost Martian, barren and rocky and with a reddish hue. On the way we passed the wreckage of a light plane that crashed last Christmas. It was doing an illegal sightseeing flight and got lost. Ironically all the passengers were killed but the pilot survived. 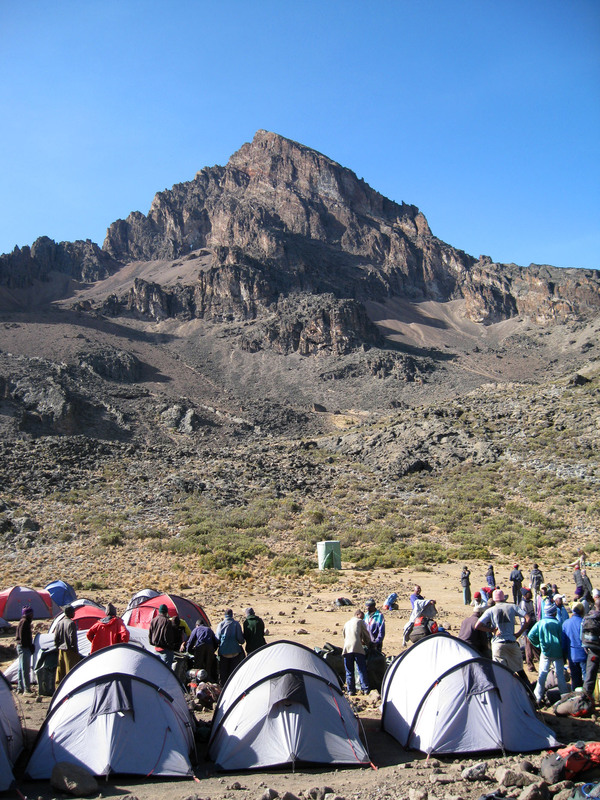 The campsite at Kibo (4,700m) was a welcome sight that afternoon. After an early meal, we went to bed at 6 to rest before getting up at 10pm for the summit attempt. However, the scene that greeted us was very different to when we got into out sleeping bags, as there was now 2" of snow covering everything. The mess tent had all but collapsed under the weight. Having had some "breakfast" we set of at 11pm trudging slowing up the steep zig-zag path towards Gilman's Point some 985m higher, our way lit by head torches. The going was very hard because of the snow, with much slipping and sliding. It took us two hours longer than expected to reach Gilman's Point (5,685m) and it was already light at 6am. Two of our party had failed to reach Gilman's Point due to sickness, and another turned back shortly after when he felt crackling in his lungs. The remainder of us continued the slow plod around the crater rim to finally arrive at the summit (5,895m) at 8am. It was bright and sunny, with no wind, so excellent for summit photographs. Unfortunately there was low cloud all around, so we saw very little of the crater and the glaciers. After the photos, our guides quickly ushered us back down, not wanting us to stay at this altitude for too long. The return to Kibo was achieved in a much quicker time of around 3 hours! After a meal and rest we continued for another 3 hours to that night's camp at Horombo. All in all a very long and exhausting day, with around 15 hours walking. The last day was a gentle stroll of around 20km through the rain forest, with lots of exotic plants, and several troops of Blue monkeys, reaching the gate at Marangu mid-afternoon for the minibuses to take us back to the hotel. Never has a shower felt so good!! On the next day, one of the porters (whose brother lives in Milton Keynes!) took us into the town of Moshi, where we visited some workshops for the disabled, where they produced some wonderful handicrafts, and we bought some souvenirs. The town centre was very busy and noisy, and as soon as we started walking around we were surrounded by people trying to sell us things. They would not take no for an answer and it got quite unpleasant, so we took refuge in a hotel where we had drinks and lunch before getting taxis back to our hotel. I would like use this event to raise sponsorship in aid of the Kendal Mountain Rescue Team. I have paid for this trip myself so all money raised will go to the charity. I would be grateful for any sponsorship money that you are able to give. To those who provide an email address, I will send a report on the trek on my return, hopefully with a photo of me at the summit!